A simple practice you can begin today. Kwavi Agbeyegbe, Certified Weight Loss + Lifestyle coach + Speaker who helps women over the age of 40 practice self- care while managing their health, mindset and waistlines. What is self-care? Self-care is the simple practice of taking care of you by doing activities for yourself that nurture your mind and body. 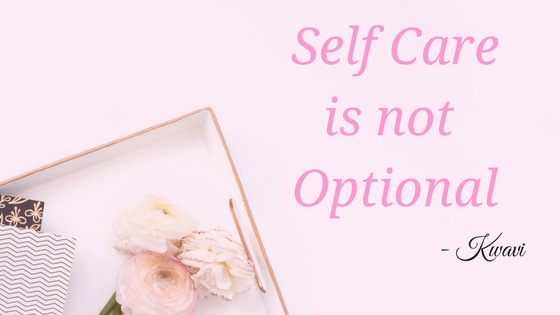 Self-care is not an option, it’s a need. Self-care is not a selfish act its an act of selflessness. When you take the time to take care of you, you are able to take care of your loved ones and others around you. As a female, maybe employed or self-employed, maybe a mother, maybe a wife, definitely a daughter, perhaps a sister, perhaps an aunt and a host of other roles, life can get very busy. Demands from family members and friends coupled with work demands, leaves us with no time for ourselves as we practice the juggling act of time versus tasks. It’s exhausting as we come home night after night feeling spent and nothing to give so we hop into bed only to began the same routine the next day. Most women I speak with say they have no time to take care of themselves. You have to make the time. You have to find the time. You have the power to do that and only you can make that choice. No one can make that choice for you. You can’t give from an empty cup. It finally gets to a point where you have nothing left to give to yourself or those around you that need and depend on you. It’s not sustainable to keep on giving to others without giving to yourself. Getting to that breaking point where things begin to gradually fall apart within and around you can be avoided by practicing self-care daily. One of the ways to practice self-care everyday is by putting the time in your calendar. Set an alert for it or write it down in your calendar. Make it non-negotiable time. A good idea would be to put it in your schedule as early in the morning as you can, preferably before everyone else wakes up. This appointment should be for at least 20 minutes. I know you can find 20 minutes in your day, if you commit to doing so. Use this time to meditate. This time is all about you. No one else but you gets to enjoy your own company. Enjoy the peace and quiet of being still with yourself. Maybe you’re not sure how to go about meditating. There are various apps like Headspace, Omvana, Calm to mention a few. Don’t allow yourself to make excuses to forego this precious time. Commit to doing it for 7 days straight. You will be amazed at the difference. Go ahead and give a it a try. You need it. You deserve it. You’re worth it. Kwavi Agbeyegbe is a Certified Weight Loss + Lifestyle coach and Speaker who helps women over the age of 40 practice self- care while managing their health, mindset and waistlines. Feeling good in your body and in your life can be easy. It has nothing to do with strict eating guidelines and long hours in the gym and everything to do with small shifts in the way you nourish your mind and body. Download the Vibrant Lifestyle Guide and turn your life into your own catwalk.